Before we get to the special legislative update, patients need your help! HHS is seeking input on the Administration’s blueprint for lowering prescription drug costs and the deadline is July 16. There are many reasons why prescription drugs are unaffordable. One of the most underappreciated is the “safe harbor” in the Medicare Anti-Kickback Statute enjoyed by Group Purchasing Organizations (GPOs) that has been further extended by HHS administrative guidance to Pharmacy Benefits Managers (PBMs). It is time for HHS to support Congressional repeal of 42 U.S.C. § 1320a-7b(b)(3)(C) and for the agency to revoke any related guidance and regulations, like 42 C.F.R. § 1001.952(j), that protect improper kickbacks. Physicians Against Drug Shortages calculates that such “corrupt practices have driven up the prices of drugs sold by PBMs to individual consumers by at least $100 billion annually.” This is in addition to the $100 billion per year in inflated supply costs that result from kickbacks to GPOs. For additional details see: http://www.physiciansagainstdrugshortages.com/. After submitting comments to HHS please write your congressperson or senators or the candidates vying for their seats. Half the states have started addressing the problem (as you’ll read below) and now it is Congress’ turn to roll back failed policies and help all Americans save money on their prescription medications. Click here for a sample letter you can send. Pharmacy Benefits Managers (PBMs) are the middlemen who negotiate discounts and rebates for private and government insurers. The money saved is supposed to go back to the government (taxpayers) or to insurers to lower premiums or otherwise benefit patients. The key players are CVS Health, Express Scripts, or United Health. 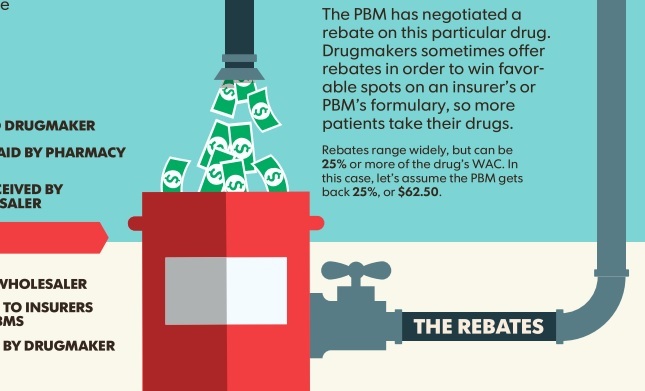 PBMs typically are paid by a percentage of the rebate or discount off the list price. 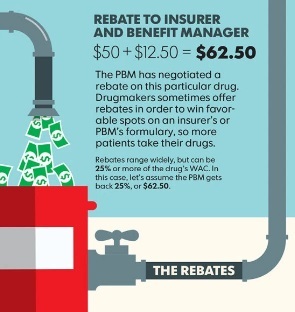 Over time, PBMs have become more focused on the size of the rebates than on getting the lowest possible costs and the best deal for patients. The higher the price, the bigger the rebate. Click here for an infographic from Kaiser Health News unpacking this byzantine payment structure. Patients whose insurance cost-sharing is tied to the price of a medicine (i.e., patients with coinsurance) and those who fill a prescription before meeting their deductible are typically charged based on the undiscounted list price. The patient may pay more than the health plan does. Additionally, some of the PBM contracts have gag clauses preventing the pharmacists from telling insured patients about the lower cash price. Patients overpay for prescription medications 23 percent of the time. Patients often aren’t told they could pay less by not using insurance. If the insurance co-pay is higher than the actual cost of the drug, the middlemen (PBMs) keep the difference. The Know the Lowest Price Drug Act of 2018, S. 2553 was introduced March 14, 2018 by Sen. Debbie Stabenow (D-MI) and referred to the Senate Finance Committee. The bill has 9 cosponsors: John Barrasso, MD (R-WY), Bill Cassidy, MD (R-LA), Susan Collins (R-ME), Claire McCaskill (D-MO), Ron Wyden (D-OR), Sherrod Brown (D-OH), Rand Paul, MD (R-KY), Joe Donnelly (D-IN), Rob Portman (R-OH). This bill prohibits health plans and pharmacy benefits managers from restricting pharmacies from informing individuals enrolled in Medicare Prescription Drug Plans about lower prices for drugs and biologicals. The Patient Right to Know Drug Prices Act, S. 2554, was introduced by Sen. Susan Collins (R-ME) on March 14, 2018 and referred to the Senate Health, Education, Labor, and Pensions Committee. The bill has 6 cosponsors: John Barrasso, MD (R-WY), Bill Cassidy, MD (R-LA), Claire McCaskill (D-MO), Tina Smith (D-MN), Debbie Stabenow (D-MI), Joe Donnelly (D-IN). This bill prohibits a health-benefits plan or pharmacy-benefits manager from restricting a pharmacy from informing an enrollee in an ACA Exchange plan of any difference between the price of a drug or biological under the plan and the price of the drug or biological without health-insurance coverage. Legislation to end the Group Purchasing Organization (GPO) “safe harbor” to federal anti-kickback law, also exploited by PBMs, is ready to go but needs a sponsor to introduce it. The 2-page bill would repeal 42 U.S.C. 1320a–7b(b)(3)(C), a big step towards stopping the abuse of rebates (aka kickbacks), lining the pockets of PBMs on the order of $100 billion per year. Alaska: HB240. Requires PBMs to be licensed with the state. Requires PBMs to tell pharmacies the methodology and sources used to determine the drug pricing list. Arkansas: Act 1. Requires PBMs to be licensed with the state. PBM contracts cannot prohibit the pharmacy from discussing the insured’s total cost for the pharmacist’s services or from selling a more affordable alternative to the insured if one is available. (1) Prohibit a pharmacist or pharmacy from, or penalize them for, providing an insured individual information on the amount of the insured’s cost share for the insured’s prescription drug and the clinical efficacy of a more affordable alternative drug if one is available. (2) Require a pharmacist or pharmacy to charge or collect from an insured a copayment that exceeds the total submitted charges by the network pharmacy. California: AB 315, Pharmacy benefit management. This bill would require a pharmacy to inform a customer at the point of sale for a covered prescription drug whether the retail price is lower than the applicable cost-sharing amount for the prescription drug, unless the pharmacy automatically charges the customer the lower price. If the customer pays the retail price, the bill would require the pharmacy to submit the claim to the plan or insurer in the same manner as if the customer had purchased the prescription drug by paying the cost-sharing amount when submitted by the network pharmacy. The bill would provide that the payment rendered by an enrollee would constitute the applicable cost sharing, as specified. The bill would provide that a violation of those provisions would not be grounds for disciplinary or criminal action. The bill would require pharmacy benefit managers to exercise good faith and fair dealing. Among other things, the bill would require a pharmacy benefit manager to notify a purchaser, as defined, in writing of any activity, policy, or practice of the pharmacy benefit manager that directly or indirectly presents a conflict of interest that interferes with the discharge of the pharmacy benefit manager’s duty to the purchaser to exercise good faith and fair dealing. The bill would require a pharmacy benefit manager to disclose, on a quarterly basis, and upon the request of the purchaser, certain information with respect to prescription product benefits specific to the purchaser, including, but not limited to, the aggregate wholesale acquisition costs from a pharmaceutical manufacturer or labeler for certain therapeutic drugs and any administrative fees received from a pharmaceutical manufacturer or labeler. (2) Requiring a pharmacy to charge or collect a copayment from a covered person that exceeds the total submitted charges by the network pharmacy. (1) A PBM cannot prohibit a pharmacy from discussing information concerning the amount of the covered individual’s cost share for a prescription drug or from selling to the covered individual a more affordable alternative if an affordable alternative is available. (2) the amount of total approved charges by the pharmacy benefits manager at the point of sale. Kansas: SB351, Kansas Pharmacy Patients Fair Practices Act. (1) Co-payments applied by a health carrier for a prescription drug may not exceed the total submitted charges by the network pharmacy. (2) A pharmacy or pharmacist has the right to provide a covered person with information regarding the amount of the covered person’s cost share for a prescription drug. A PBM cannot prohibit a pharmacy from discussing any such information or selling a more affordable alternative to the covered person, if such alternative is available. Kentucky: HB463. The bill prohibits an insurer, pharmacy benefits manager, or other administrator from prohibiting a pharmacist or pharmacy from, or penalizing them for, discussing information relating to cost sharing or selling a more affordable alternative to the insured. Louisiana: HB 436. Insurers and PBMs cannot prohibit by contract a pharmacy or from informing a patient of all relevant options when acquiring his prescription medication, including but not limited to the cost and clinical efficacy of a more affordable alternative if one is available and the ability to pay cash if a cash price for the same drug is less than an insurance copayment or deductible payment amount. (2) discussing with a beneficiary a certain retail price or certain cost share for a prescription drug. Mississippi: HB709. The bill provides that pharmacists may provide additional information to a patient to allow them an opportunity to consider affordable alternative payment options when acquiring their prescription medication. Missouri: SB826. PBMs cannot include in their contracts with pharmacies and pharmacists a provision that requires a covered person to make a payment for a prescription drug at the point of sale in an amount that exceeds the lesser of: (1) The copayment amount as required under the health benefit plan, or (2) the amount an individual would pay for a prescription if that individual paid with cash. Pharmacists have the right to provide a covered person information regarding the amount of his cost share for a prescription drug, the cost of an alternative drug, and the person’s cost of the drug without adjudicating the claim through the pharmacy benefits manager. A PBM cannot prohibit a pharmacy from discussing or selling a more affordable alternative to a covered person. New Hampshire: HB1791. A PBM contract cannot contain a provision prohibiting divulgence to a covered person or the insurance department relative to monetary matters which would prove beneficial in lowering costs to such covered person. (3) prohibit a pharmacist or pharmacy from offering and providing direct and limited delivery services to an insured as an ancillary service of the pharmacy. (1) A pharmacy benefits manager may neither prohibit nor penalize a pharmacist or pharmacy for providing cost-sharing information on the amount a covered individual may pay for a particular prescription drug. (2) It is considered to be a false, misleading, deceptive, or unfair practice if a PBM (a) Prohibits a pharmacy from, or penalizes for, providing cost-sharing information on the amount that a covered individual may pay for a particular prescription drug by a pharmacist or pharmacy. Tennessee. SB2362. A pharmacy has the right to provide an insured information regarding the amount of the insured’s cost share for a prescription drug. A PBM may not penalize a pharmacist for discussing any information about drug pricing or for selling a lower priced drug to the insured if one is available. (iii) alternative methods of paying for the prescription medication, including paying the cash price, that are less expensive than the cost share of the prescription drug. Virginia: HB1177. A PBM contract cannot contain a provision that (i) authorizes the carrier or its pharmacy benefits manager to charge, (ii) requiring the pharmacy or pharmacist to collect, or (iii) requiring an enrollee to make, a copayment for a covered prescription drug in an amount that exceeds the least of the applicable copayment for the prescription drug that would be payable in the absence of this section or the cash price the enrollee would pay for the prescription drug if the enrollee purchased the prescription drug without using the enrollee’s health plan. PBM contracts must allow a pharmacy to (a) disclose to an enrollee information relating to the provisions of this section and the availability of a more affordable therapeutically equivalent prescription drug; (b) sell a more affordable therapeutically equivalent prescription drug to an enrollee if one is available; and (c) offer and provide direct and limited delivery services to an enrollee as an ancillary service of the pharmacy. Vermont: S92. PBMs may not prohibit or penalize a pharmacy for providing information to an insured about the insured’s cost-sharing amount for a prescription drug, disclosing to an insured the cash price of a prescription drug, or selling a lower-cost drug to an insured if one is available. This act directs a pharmacist who receives a patient’s prescription for a biological product to dispense to the patient the lowest-price interchangeable biological product, if one exists, and to notify the prescriber about the specific biological product dispensed. It requires health insurance plans to apply the same cost-sharing requirements to interchangeable biological products as apply to generic drugs under the plan. The act also creates a working group to look at prescription drug pricing throughout the supply chain to identify opportunities for savings and for increasing price transparency. West Virginia: SB46, Pharmacy Audit Integrity and Transparency Act. (2) PBMs are prohibited from penalizing a pharmacy for discussing cost information or for selling a lower cost alternative to a covered individual, if one is available, without using a health insurance policy. (3) PBMs are prohibited from collecting cost shares exceeding the total submitted charges by a pharmacy.